Books in Browers 2013 is the highly regarded annual book-meets-tech conference in San Francisco, and I had the privilege of giving a presentation this year. Books in Browers 2013 was one of the best conferences I have attended. The programming was intelligent and thoughtful. Sessions were grouped, and each presentation within a session complemented the others, so that by the end of the conference both a palimpsest and a narrative structure emerged. Many of the presentations, including my own, referred to earlier histories of storytelling and of the book itself. The subtext to many of the presentations was the idea of ‘context first’, i.e. that in a digital networked world, context, all the related information surrounding the main content and the book itself, is not only important but critical. The idea of ‘context not container’ was first raised at Books in Browsers in 2010 by Brian O’Leary of Magellan Media Partners in his presentation ‘Context First’, and it continues to inform and influence thought about books and publishing. (‘Context not Container’ appears in Book: A Futurist’s Manifesto, available to read online). My presentation on fan fiction (Beyond the Text: Writing Undercover on the Web) extrapolated Brian’s idea. Amongst other things, I talked of how the physical boundaries of the book have become synonymous with the boundaries of the story or content itself. Fan fiction on the internet is the manifestation of a hybrid, more fluid and nuanced understanding of story and storytelling: drawing on oral storytelling traditions, and is both performative and written. In his entertaining presentation, Corey Pressman used the word “paratext” to describe “context” and drew a direct line from Stone Age tools to the smartphone. Several speakers explored how to address and incorporate ‘context’ into the networked book. Anthon Astrom of Astrom/Zimmer provided an aesthetically beautiful and also functional design for tracing the lineage of annotations and conversations. Hypothes.is showed their impressive contribution with two open source projects with huge potential: Epub.js and their own hypothes.is. Using an API to make context available was a feature of the hackday on the Saturday. Kate Pullinger, co-author with Chris Joseph of the groundbreaking Inanimate Alice is doing very interesting work online with her novel Flight Paths. In an exciting move, the digital division of her publisher, Random House Canada, developed an API for an excerpt from the follow-up book, Landing Gear, for use at the conference hackday. (For details of the API and related information see the website for the Random House API). There were wonderful presentations at the intersection of tech, design and art, with one drawing spontaneous mid-presentation applause: Etienne Mineur’s imaginative inventions: playful books and board games integrated with technical wizardry linked to the internet. (See the company’s website: Volumique). Manuel Schmalstieg of ms-studio handily uploaded his live notes for all the sessions too. Brian O’Leary wrote a post on Collaborative Creation, addressing the first morning of the conference. Update: Peter Brantley, Porter Anderson and Lynn Rosen have all written excellent articles on the conference. 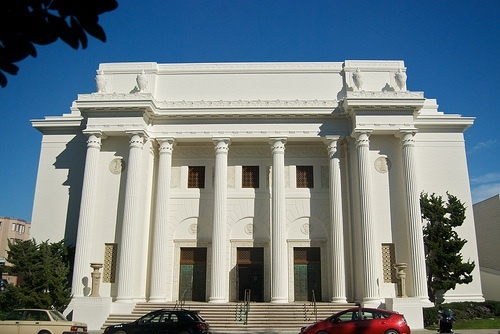 The venue, The Internet Archive, was itself a metaphor for the conference: integration of old and new, a reimagining of culture, space and purpose. The building used to be a Christian Science church and now houses one of the largest digital archives in the world, and is staffed by a group of committed people working to keep the internet free and open. The servers blinking away at the back of the ‘auditorium’ hint at the new gods at work and play. And the Psalms at either side of the stage reflected, respected, acknowledged and incorporated the building’s origins. It was a remarkable conference for the juxtaposition and blend of the old and the new, as well as for the meticulous and wonderful timekeeping. Peter Brantley (@naypinya) of hypothes.is and Kat Meyer (@katmeyer) of the Frankfurt Book Fair, and all the sponsors and speakers should be congratulated on a truly excellent and thought-provoking conference. You are currently reading Books in Browsers 2013 – Reflections at Say Books.